Like many of us, I've always been entranced by the performances of female Olympic gymnasts — so much so that, after the 1992 summer Olympics, I made an executive decision: I was ready to take up competitive gymnastics and, obviously, become an instant superstar. My parents were less thrilled about my new life plan; and although I'm sure it was because of the expense of lessons, they told me I couldn't start training for my spot on Team U.S.A. for health reasons — gymnastics would stunt my growth, they said. As someone who, at age 8, was frequently mistaken for a kindergartener, I didn't want to take the risk. But while I haven't spent much time since mourning my missed chance to rock an American flag-print warm-up suit, I have always wondered: does gymnastics actually stunt your growth? Or are gymnasts so short because small people just tend to be better suited to gymnastics? It turns out that the scientific community itself isn't entirely sure — but the idea that gymnasts would have grown to be a foot taller, if only they hadn't spent all the time on the parallel bars, is absolutely a myth. 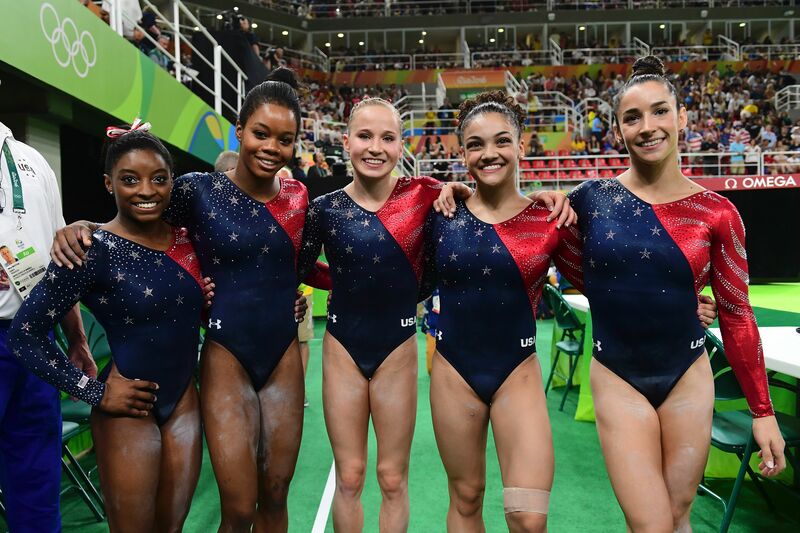 When you examine CDC statistics of average female heights, you can see that the average 19-year-old woman is around 5'4" — giving her a solid eight inches on 19-year-old Biles. But while the urban myths state that training keeps gymnasts from developing, there's strong evidence that women with smaller frames end up pursuing gymnastics because it is one of the few sports where being tiny is a boon. Dr. Kevin Thomson, a physiologist who wrote about the physical qualities of gymnasts for the BBC, noted that "being small helps with rotational skills (for example, somersaults). For the same reason, gymnasts also tend to have short arms and legs." So just as basketball seems to draw taller people to its ranks, people who are naturally of a below-average height seem to gravitate to gymnastics, and may be more likely to excel at it than people closer to national height averages. Other research has also suggested that the terminally tiny seek out gymnastics careers; one study from the 1980s suggested that most gymnasts were already shorter than their peers by age four. Dr. Robert M. Malina, professor emeritus in the department of kinesiology at the University of Texas at Austin, suggested to Salon that most gymnasts are short because they have short parents, rather than because over-training stunted their growth. However, the fact that gymnasts are small can't all be credited to self-selection. A 2000 study published in the Journal of Pediatrics found that, while the sport does draw women who are short and have delayed bone age (delayed bone age means that your skeletal maturation is lagging behind your actual age), gymnastics training can have some impact on growth. The study of 83 active female gymnasts, 42 retired gymnasts, and 154 healthy non-gymnasts, found that active gymnasts had some deficits in leg length and sitting height — but it wasn't typically permanent. Once they retired in their late teens or early twenties, most gymnasts "caught up" on growth. The study concluded that "[a]dult gymnasts who had been retired for 8 years had no deficit in sitting height [or] leg length...A history of gymnastic training does not appear to result in reduced stature...in adulthood." And in case you were wondering— yes, elite gymnastics training does seem to often delay the onset of menstruation. One 1996 study found that only 20 percent of 13-year-old gymnasts, compared with 95 percent of average 13-year-olds, had gotten their first period, and that gymnasts were at risk of exercise-induced amenorrhea — a state where the body stops menstruating due to low body weight and hormones released during exercise. Luckily, The Journal of Pediatrics study found that gymnasts didn't seem to experience any kind of menstrual dysfunction as adults due to their youthful training. Similarly, a 2002 study of 262 competitive gymnasts, aged 13 to 23, conducted by researchers at the University of Patras Medical School in Patras, Greece found that gymnasts exhibited delayed bone age — male gymnasts were seen to be one year behind their actual age, while female gymnasts were shown to be two years behind — which study leader Kostas Markou believed was caused by training. "The earlier the age of onset of exercise," wrote Markou, "the worse the effect on bone acquisition." But the study also reported that the situation wasn't necessarily permanent; they too found that many gymnasts "caught up" their delayed height and bone maturation after they retired. And a 2001 study published in the Clinical Journal of Sports Medicine found that "a cause-effect relation between gymnastics training and inadequate growth of females has not been demonstrated," though it also noted that "[t]here is conflicting evidence" as to whether gymnasts really hit their full potential regarding height during "the 'catch-up' [phase] ." The study also speculated that inadequate nutrition during training years, rather than the physical exertion of gymnastics training itself, might be related to the small stature of gymnasts; NBC has reported that gymnasts typically "try to get between 60 percent and 70 percent of their calories from proteins (like meats and cheeses), the rest from carbs (like whole-grain pasta, fruits, vegetables) and fats (like oils from peanuts)" — a diet that has not been formally linked with stunted growth, though historically, eating disorders have been an issue within the women's gymnastics community. So while the training regimen of elite gymnasts seems to have some impact on their height, it's likely less severe — and far less permanent — than what you've heard. Which is good news for gymnasts worldwide — but probably bad news if you gave up on your gymnastics career just because you were afraid of never growing tall enough to reach the top aisle at the grocery store.